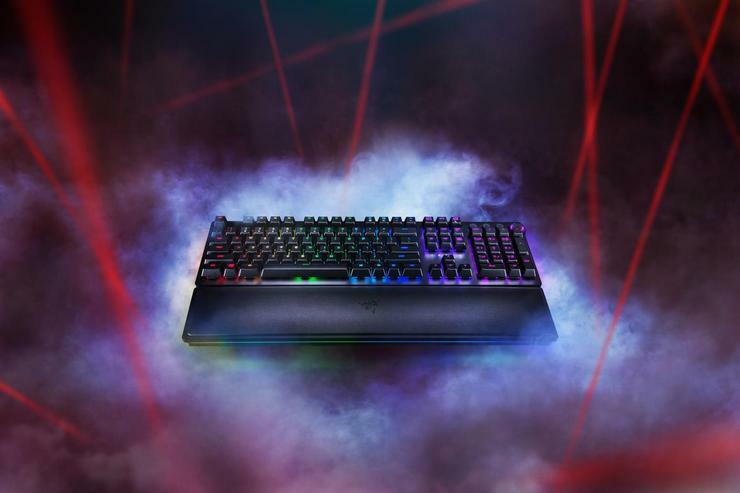 Razer are looking to build on their legacy in the gaming peripherals space with the new Huntsman and Huntsman Elite keyboards, which feature Opto-Mechanical switches. “We have amassed years of experience developing and manufacturing our very own Razer Mechanical Switches designed specifically for gamers,” says Razer CEO and Co-Founder Min- Liang Tan. These Opto-Mechanical Switches are said to be the key advantage on offer here. According to Razer, these switches rely on an infrared light beam inside to precisely detects actuation when a key is pressed. With a 1.5mm actuation point, Razer Opto-Mechanical Switch promise to actuate 30% faster than traditional clicky mechanical switches. The new switches also feature identical actuate and reset points, allowing for rapid fire keypresses as found in a linear switch. The reduced reliance on moving parts is also said to provide added durability. Razer claim the lifespan of a Razer Opto-Mechanical Switch is rated up to 100 million keystrokes, double that of traditional mechanical switches. Both the Huntsman and Huntsman Elite keyboards come fully outfitted with these new switches full integration with Razer's Chroma and Synapse lighting ecosystems. Similar to the Razer Ornata Chroma and BlackWidow Chroma V2, the Huntsman Elite also features a magnetically detachable, leatherette wrist rest with built-in Chroma LED lighting. It also features a robust set of media keys on the upper right corner which Razer say can easily be remapped for other functions. The Razer Huntsman and Huntsman Elite are available now via the Razer webstore for an RRP of $249.95 and $339.95 respectively.